If you’re looking for a 27-inch monitor for a budget-friendly price, the Acer R271 is the most cost-effective choice by far. It features an IPS panel with vibrant and rich colors as well as a modern ultra-slim design. Due to its affordable price, the Acer R271 is an excellent gaming monitor, especially for console gaming. 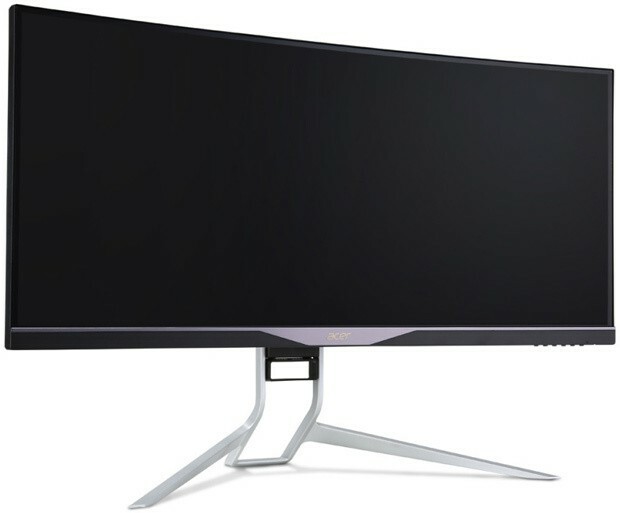 The Acer R271 monitor is based on LG’s AH-IPS panel which delivers 16.7 million colors with 8-bit color support and decent 91% sRGB color gamut. The colors are vivid, intense, and consistent, but they do not meet the demands required for professional photo editing. As far as gaming, movie watching, and other multimedia activities are concerned, the IPS panel of the Acer R271 brings life to colors in comparison to the TN panel monitors. Additionally, the viewing angles amount to 178-degrees both horizontally and vertically ensuring that the image won’t shift in color and contrast when it’s viewed from peculiar angles. While watching movies with friends, for example, the wide viewing angles will allow for everyone to enjoy the flawless picture no matter where you’re sitting. The only drawback of the Acer R271 is its Full HD (1920×1080) screen resolution which is somewhat low for the 27-inch screen size. The pixel density amounts to roughly 81 PPI (Pixels Per Inch) meaning that when you’re sitting too close to the screen, you’ll notice that the image is rather pixel-y. This isn’t as noticeable in video games and especially not while watching movies as you’re watching the monitor from a greater distance. Therefore, it’s recommended to sit a bit further from the monitor for the best viewing experience, which is acceptable due to the large 27-inch screen. Overall, the monitor is perfect for movies and console gaming while the image in other activities that require you to sit in front of the monitor may appear too smudgy to you if you’re coming from a display with a higher pixel density. The Acer R271 IPS monitor is factory-calibrated and ready to use straight out of the box. We didn’t encounter any dead pixels nor prominent backlight bleeding and IPS glow. A slight glow around the edges is noticeable on dark backgrounds in dim lit rooms, but that’s normal for the IPS panels as in turn, you get such vibrant colors. 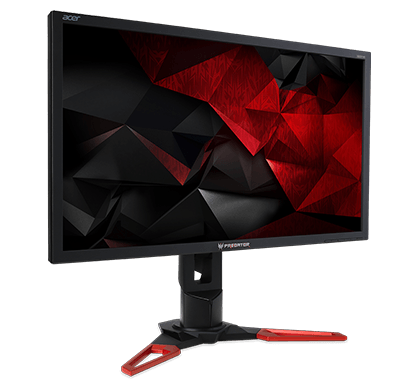 If you’re looking for a monitor for competitive gaming, you’d be better off with a 144Hz gaming monitor you could get for almost the same price. Furthermore, these budget gaming monitors feature a TN panel with the quick 1ms response time speed for minimal motion blur in the fast-paced games. However, they don’t have as rich colors nor such wide viewing angles. 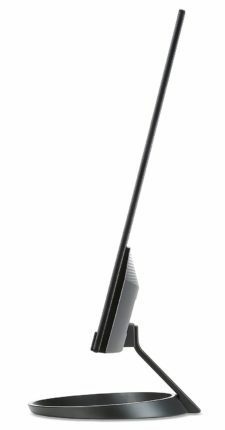 The Acer R271 response time speed amounts 4ms which is satisfactory for casual gaming and will eliminate most of the ghosting of the fast-moving objects. More importantly, the input lag amounts to only 9ms which ensures a responsive gameplay with virtually zero lag. Depending on your GPU, you may be able to overclock the refresh rate from the native 60Hz to 75Hz for extra smoothness while gaming. The OSD (On-Screen Display) of the monitor is rather simple with only basic settings such as brightness, contrast, color temperature, and 6-axis color settings. The five OSD buttons can be used as shortcuts for the following functions: Acer eColor Management pre-calibrated picture presets (User, Eco, Standard, Graphic, Movie), auto adjustment (VGA), adjusting the volume of the built-in speakers, swapping between input sources, and entering the OSD menu. The Acer R271 1080p monitor also features a low blue light filter which eliminates the harmful blue lights and allows for comfortable viewing experience for long hours. Additionally, the display is flicker-free, so it won’t cause headaches to those sensitive to screen flickering. In the ‘Settings’ section of the menu, you can also adjust the OverDrive parameter which can increase the response time speed if needed. As you can see, the Acer R271 design is extremely thin with narrow bezels and a modern appearance. However, the design isn’t as practical since it’s tilt-only (-5°,15°) and doesn’t offer VESA mount compatibility. The screen of the monitor is coated with a matte finish which eliminates the sunlight reflection. Connectivity consists of an HDMI 1.4, a VGA, a DVI, an audio line-out, and line-in for the 2x2W DTS integrated speakers. 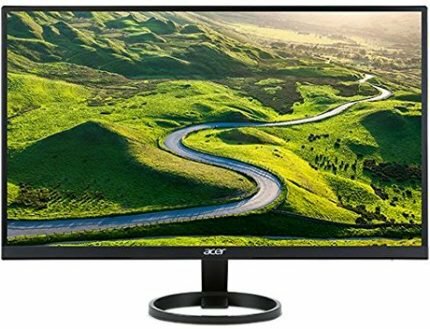 The Acer R271 price amounts to $180 at the moment (Novemeber 2017) which is the best price for a 27-inch monitor with an IPS panel and Full HD resolution. For the same amount of money (or several bucks more), you could get a 24-inch 144Hz gaming monitor, if competitive gaming is your thing. You can also get the 21.5-inch version of the monitor, the Acer R221Q for only $103; if you’re on a tighter budget, it’s definitely worth the price. Or, you could get the 24-inch version, the Acer R240HY which is the most popular one due to the best screen size/resolution ratio. If you’re looking for a monitor with a higher resolution, visit our best 1440p monitors and best 4K monitors guides. The Acer R271 Full HD monitor is absolutely gorgeous due to its slim design and thin bezels that make for a cinematic viewing experience. 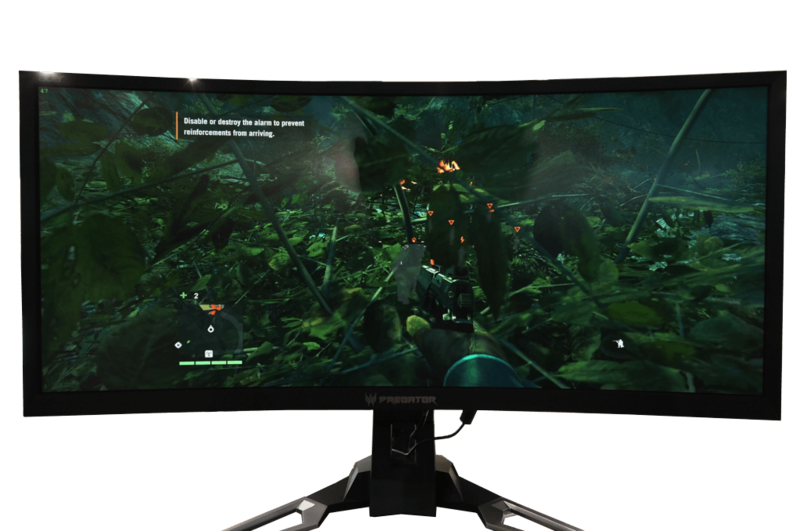 Considering its price, the monitor is perfect for the everyday use and general multimedia activities, especially for movies and console gaming – but if you’re looking for a high-quality PC gaming monitor, there are much better choices out there for the same amount of money. The Acer R271 is the best 27-inch monitor for the money. It offers an attractive ultra-slim design, vibrant colors of its IPS panel, and smooth performance. Due to its Full HD resolution and 27-inch screen size, it is best for watching movies and console gaming. For other activities, you should consider a smaller Full HD monitor, or a display with higher resolution.